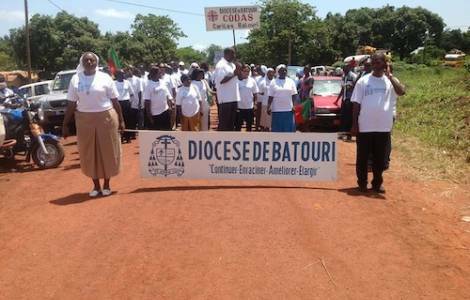 AFRICA/CAMEROON - The Bishop of Batouri: "A Church full of hope for the future, despite the difficulties"
Rome (Agenzia Fides) - "The east of Cameroon is full of hope for the future", says His Exc. Mgr. Marcellin-Marie Ndabnyemb, Bishop of Batouri, in the eastern part of Cameroon. The Bishop is in Rome to attend a Study Seminar for the Bishops recently appointed in the ecclesiastical circumscriptions dependent on the Congregation for the Evangelization of Peoples. "At an ecclesial level we have a Church in full development. In my diocese, the population supports evangelization even if it has to face considerable economic difficulties", explains Mgr. Ndabnyemb. "Despite the difficulties there are signs that leave hope for the future. It is the very strength of the population that believes in itself and above all that has faith in God who does not abandon his flock", the Bishop underlines. Mgr. Ndabnyemb recalls that "we live in an area which is rich in natural resources and can improve the living standards of the population", and adds: "the Church is making a decisive effort in favor of the rural population and the Baka pygmies". "Schools, health centers, educational activities: the Church is fully committed to society, especially in favor of young people, especially single mothers". We ask the Bishop of Batouri what is the contribution of missionaries to evangelization in the diocese he leads. "In my diocese – he replies - there is a strong presence of missionaries. Most of them are Africans even if the presence of Westerners is still strong". "The service offered by the missionaries is invaluable. We as a diocesan clergy count on them and take them as an example also at an organizational level", underlines Mgr. Ndabnyemb. The diocese of Batouri is located near the border with the Central African Republic where many people are fleeing the violence in their country. "In the diocese of Batouri there are also some hundreds of thousands of refugees from the neighboring Central African Republic. Refugees are not left to themselves", says Mgr. Ndabnyemb. "Refugees are assisted by both international and church organizations. Alongside the UN High Commissioner for Refugees (UNHCR) there is in fact the Catholic Relief Services (CRS) who work to ensure that these people live in decent conditions. Thanks to the efforts of these organizations children go to school and the sick are cared for", says the Bishop of Batouri. Finally, let us ask Mgr. Ndabnyemb what he thinks of the secessionists that are shaking the Anglo-Saxon provinces of Cameroon (see Fides 3/10/2017).